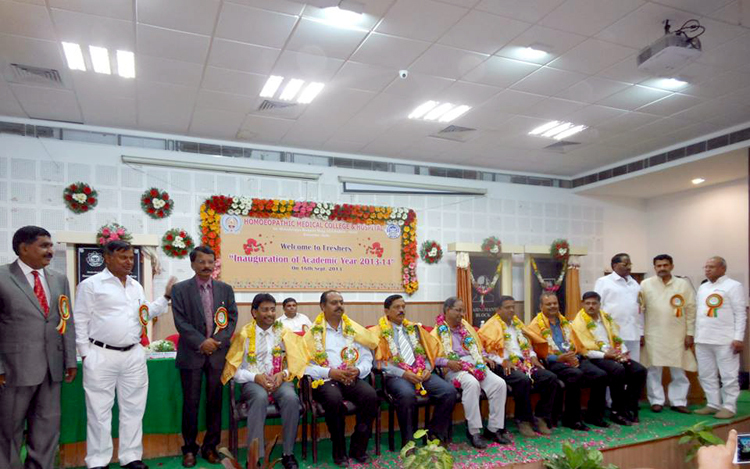 GULBURGA .SEP.16: Dr .Ramjee Singh, President of the Central Council of Homoeopathy, has said that the Health Ministry and the council have initiated steps to standardize Homoeopathy education and improve infrastructure in Homoeopathic colleges across the country. Inaugurating the 2013-14 academic year of HKE’S Homoeopathic Medical College and Hospital Dr. Ramjee Singh said that the Health Ministry wanted the accreditation of Homoeopathic colleges made stricter and permit admission only if the colleges fully complied with all the norms laid down by the council. Deviation or violation of even one per cent would not be tolerated, he said. The Union government gave a very short notice to the council for inspecting all the 186 Homoeopathy colleges in the country and permitting only those which ensured 100 per cent compliance with norms. “Quick inspection of colleges, covering only two aspects, including equipment availability and teaching faculty, revealed that in 102 colleges, the extent of deficiency was more than 25 per cent. I told the Health Ministry officials that we will have to disallow the colleges to admit students to homoeopathy courses this year too, if we insist on strict adherence to all norms,” he said. The Health Ministry, after a lengthy deliberation, agreed to postpone the implementation of the rule of strict adherence till next academic year. The council had been asked to inspect all the colleges once again from December 31 and submit a report on the conditions prevailing to the Health Ministry, which would later decide whether to continue or withhold the accreditation and whether to allow colleges to admit students from next academic year or not.